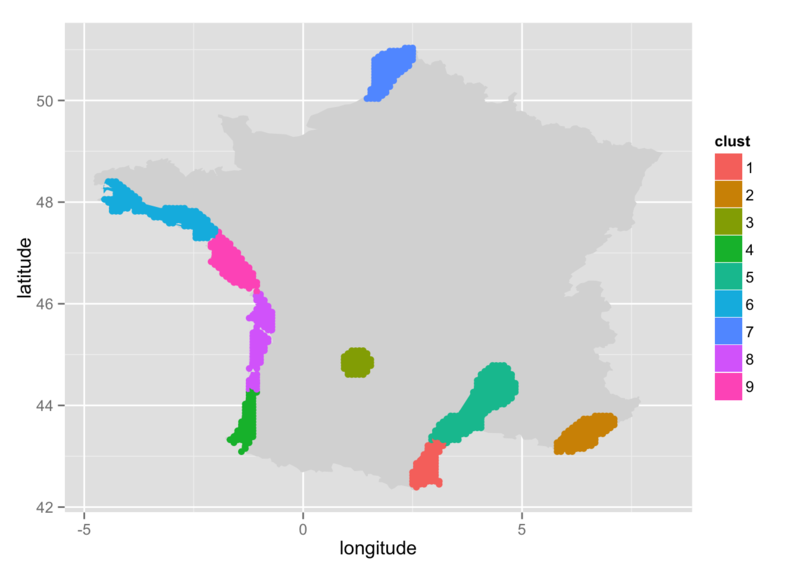 So, we decided to use the result from ashape() to try and extract the coordinates of any area. Our technique requires some handiwork. 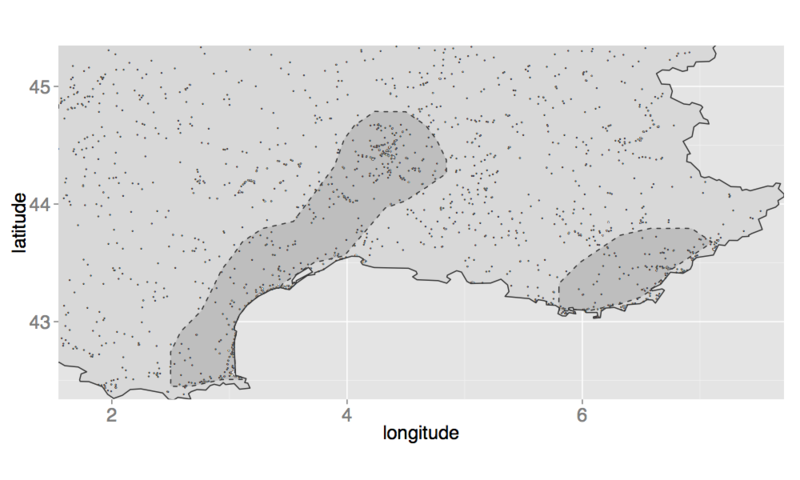 The basic idea here is that we rely on some statistical classification based on the distance separating each points. We need to create more clusters than the number of areas we desire, and then we manually regroup some clusters (by clicking on a graph). The rest of this note is divided as follows: a section introducing the functions, then a first example, and a second one. 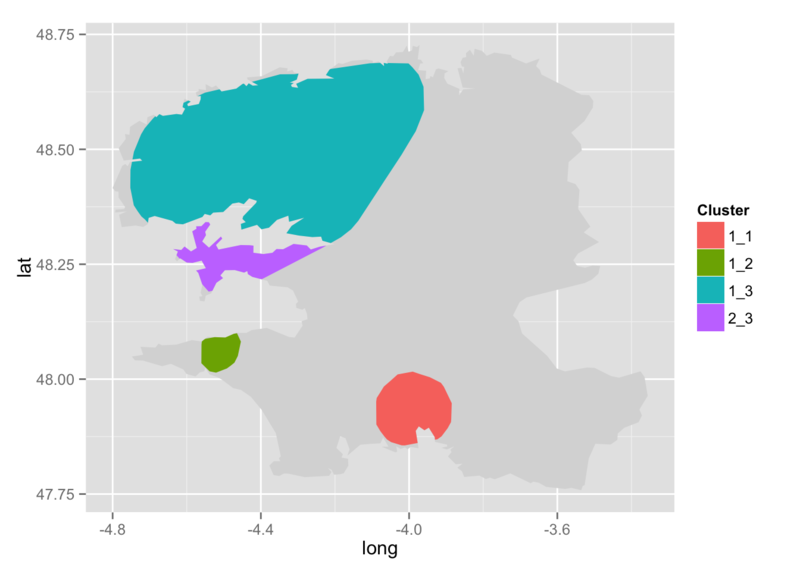 A fun application can be seen on @freakonometrics‘ blog. Now, we need a few functions. The function get_coords_pol() returns the indices of points in a given polygon (`polygon`) that define a convex hull. The result of this function is useful for the next function, coords_pol(). 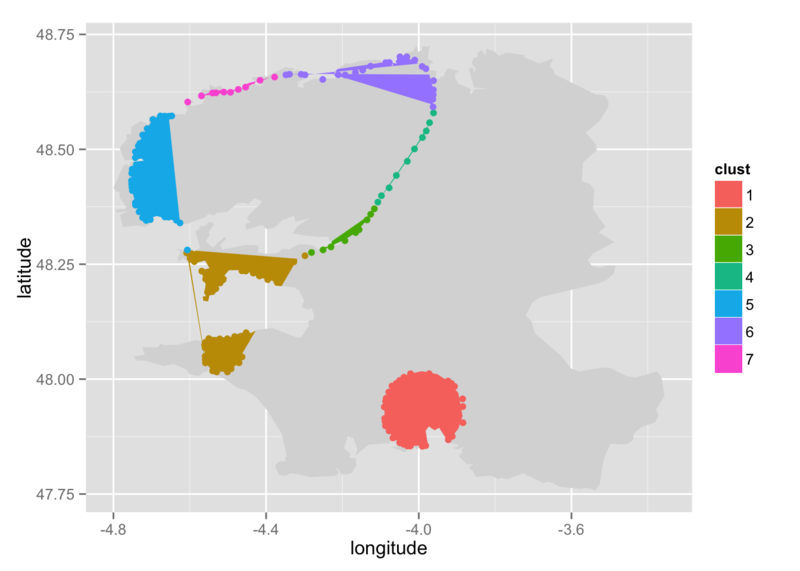 The function coords_pol() returns a `data.frame` containing the coordinates of a polygon defining a convex hull, according to a cluster ID (clust). The function pre_cut_help() returns a data.frame where each point corresponds to a point from the density estimation where the value is above the decided threshold. Each point is associated to a possible polygon. The data.frame that is returned can be viewed as a preliminary cutting. This function is then used in pre_cut_f(). The function print_map_help() prints a preliminary cutting. Each polygon is drawn. The function regroup() helps to manually regroup some polygons into a single one. The user is asked to click on the graph already displayed (if not, he has to do it using print_map_help()) to pick polygons to group. Finally, the function hull_polygons() returns a data.frame containing the coordinates for each polygon. And that’s it! Now, let’s see how it works in practice with two examples. 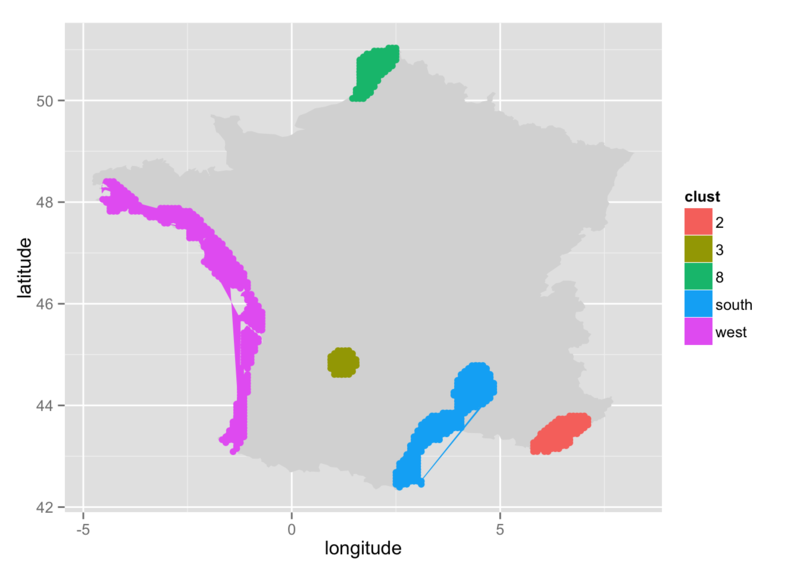 Let us load some data about campground locations in France (see https://github.com/ripleyCorr/Kernel_density_ripley/blob/master/README.md for more details). Then, we need to regroup the four polygons on the West. So we indicate that we want to regroup four polygons (n = 4). The name of the cluster will be “west” (group_name = "west"). We just need to click inside each polygon. We rely on gglocator() (package ggmap), so, if we need to print the map again, just before calling pre_cut(). It is important to use this function: print_map_help(), because we must provide a mapping parameter to ggplot(). Otherwise, gglocator() will fail. 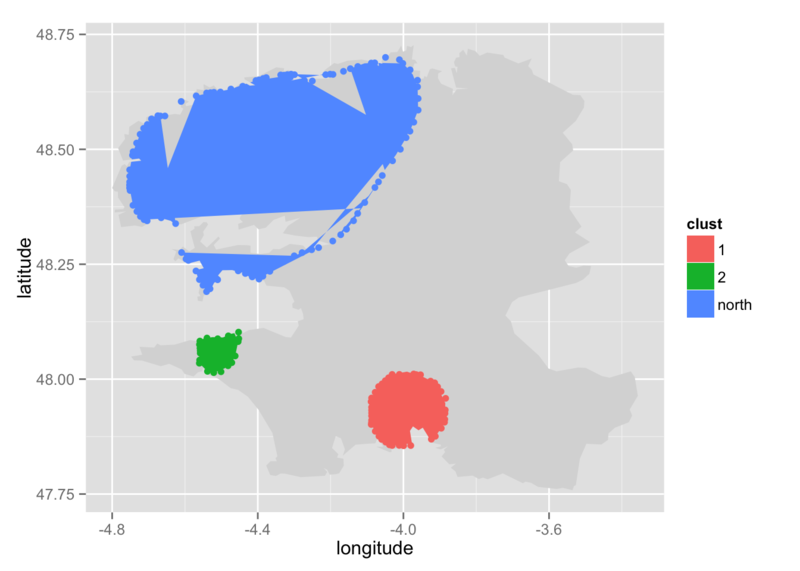 Once we’re done, we simply call hull_polygons(), to get the coordinates! First let us load the data. Once again, more details are given at https://github.com/ripleyCorr/Kernel_density_ripley/blob/master/README.md. Regroup the groups in the North. Then extract coordinates for each polygon. Anf finally, plot the result.